This field has grown cotton every year for the past fifteen years that I've been driving past it. It may have done the same for many decades. Herbicide resistant weeds poke up out of the main crop. 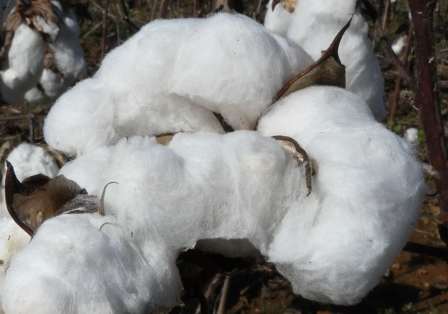 Remarkably soft cotton in a prickly boll. This entry was posted in Plants, Travels on October 18, 2011 by David George Haskell. 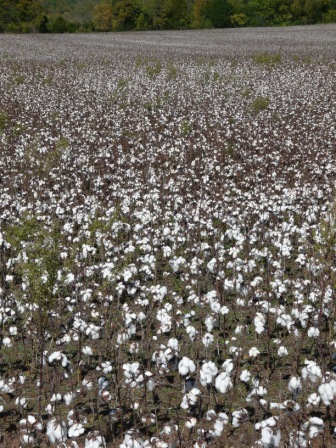 Having grown up in a rural Missouri community where cotton was the major crop before soybeans and milo took over a few decades ago, I too wondered about why there was still cotton in the fields west and south of here that hadn’t even had a “first picking.” A couple of the fields had obviously been subject to the massive cottenpicker, but much was untouched. Hope they got it before today. Can’t harvest (“get in” is the Missouri parlance) soaked cotton. I don’t read any other blog except one put out by one of my first students from the early 70’s who writes on Gulf Coast meals. No time for blogs in my life–but I really enjoy these photos and commentaries on our locale. Thanks so much. Wish I knew more about everything here. Thank you Kay.I’m glad you enjoy the blog. 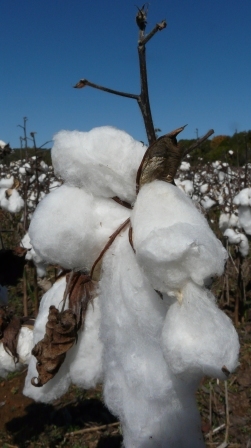 The rain surely did the cotton no good yesterday.